Some wetlands, intermittent streams and other small but important bodies of water could be polluted with impunity if the EPA fully rescinds the Waters of the US rule. The agency and the US Army Corps of Engineers yesterday opened a public comment period on the repeal. Next, the EPA would begin to overhaul the definition of what could be regulated under the federal Clean Water Act. The EPA enacted WOTUS, as it’s known, in June 2015. After 31 states, including North Carolina, and agricultural interest groups sued, the Sixth Circuit Court issued a stay of the rule, and it has not gone into effect. Gov. Roy Cooper withdrew North Carolina from the lawsuit earlier this year, because President Trump had already signaled his plan to rescind WOTUS. WOTUS would clarify the waterways to be regulated under the Clean Water Act. This doesn’t sound particularly controversial, except that economic development and agricultural interests oppose it. Farmers could no longer allow runoff from fields and livestock operations into certain waterways where they could before; builders couldn’t dump their fill there. Opponents of WOTUS claim — erroneously — that all waters, even man-made ditches, would be subject to federal regulations. However, the updated list would include only tributaries, streams, wetlands, etc. that feed already-regulated waters. 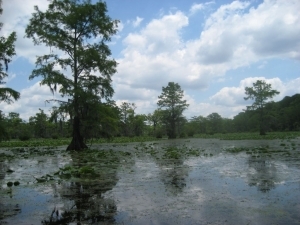 The environmental concern is that without WOTUS, drinking water sources, such as the Cape Fear River, could be further threatened by pollution from these unregulated sources. Wetlands, for example, are key not only for wildlife habitat, but they help filter pollution and prevent flooding. Opponents also assert that WOTUS is an example of federal overreach; they say states should determine what to regulate and to what extent. However, waterways know no political boundaries, and one state’s laxness can conflict with another’s stricter requirements; this is why federal standards are necessary. Exhibit A has occurred here in North Carolina. In Canton in the western part of the state, Evergreen Packaging has polluted the Pigeon River, which flows into Tennessee. In 2010, North Carolina approved a discharge permit that the EPA said was too lenient. (Clean Water for North Carolina, one of the plantiffs in a lawsuit over the discharge, has a comprehensive and sordid history on its website. The 30-day comment period opened yesterday and continues through Aug. 28. The Federal Register has the full text of the rule and more background info, along with instructions on how to comment either online, by fax or mail. You need only to look at the Chemours discharge of GenX and other chemical contaminants into the Cape Fear River to know the problem that exists in America today. Trump doesn’t care. We need the EPA and more at state level to be a watchdog for our survival.